Joyce Fienberg, 75, of Oakland, Richard Gottfried, 65, of Ross Township, Rose Mallinger, 97, of Squirrel Hill, Jerry Rabinowitz, 66, of Edgewood, Cecil Rosenthal, 59, of Squirrel Hill, and his brother, David Rosenthal, 54, Bernice Simon, 84, of Wilkinsburg, and her husband, Sylvan Simon, 86, Daniel Stein, 71, of Squirrel Hill, Melvin Wax, 88, of Squirrel Hill, Irving Younger, 69, of Mount Washington. These names represent an unprecedented level of loss for a city which prides itself on compassion. Pittsburgh is Mr. Rogers' neighborhood and the adopted home of ​Roberto Clemente. We're supposed to be better than this. Inclusive. Squirrel Hill, a historically Jewish neighborhood adjacent to the University of Pittsburgh campus, was the victim of horrific violence early Saturday morning. It was a crime of vitriol and racism in its harshest form, leaving a stunned and weeping city in its wake. It is everything we claim to be against. Pittsburgh's often described as a small town in a big city, and no area represents this ideal more than Squirrel Hill. The Tree of Life synagogue is a pillar of the community. If you're up enough early on a weekend you ought to walk down Wilkins Ave. and witness the march of families to their place of worship. They always wave. Our country's grown numb to these moments. Mass shootings, even racially-motivated tragedies, tend to fade to national obscurity after the President's morning tweet-storm, let alone with midterm elections looming. Locally, it never leaves us. And this plays right into Pittsburgh's hand. A city in mourning can produce some of its best work, and Pittsburgh's been through a hell of a lot. So where do we go from here? What might that look like? Look no further than this past weekend. ​No city relates more to its sports teams or athletic makeup than Pittsburgh, but this weekend was far different than any of us could've imagined. 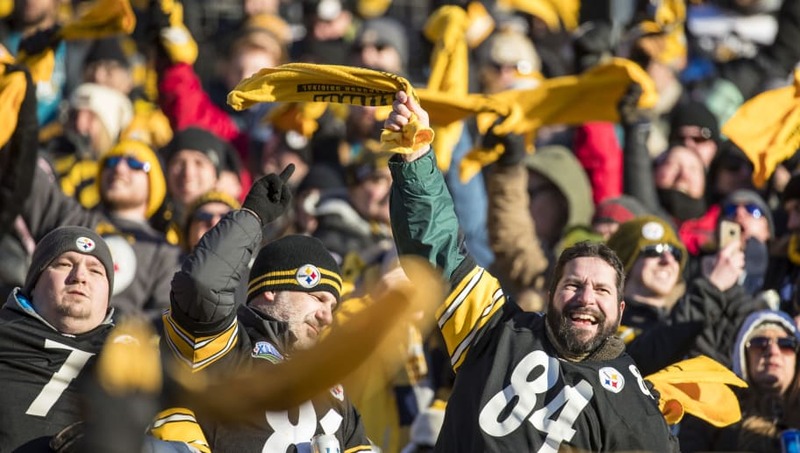 Less than six hours after the worst anti-semitic act in our country's history, Heinz Field was set to play host to a college football game, and 24 hours later a heated ​AFC North matchup. How do sports play a role in this rebuild? Pittsburgh sports are intertwined with the community, and the athletes embrace the concept of being a role model. As leaders in a dark time, they responded thusly. A sense of unity bonds this city, similar to steel in hot flames. You'll have to excuse the metaphors when they're appropriate. Adversity is nothing new to this city, having persevered through an economic downturn which saw an unprecedented move away from steel, the backbone of the entire Pittsburgh economy. The environmental implications from relying on an unchecked industry for decades were immense. Yet here we are years later, and Pittsburgh is thriving, with old mills being replaced by some of the best hospitals this country has to offer, and a growing number of parks and green space. Nonetheless, a certain mentality has remained. Our football team is a symbol of that forgotten era, paying tribute to those who quite literally built the bridges and skyline we've grown accustomed to. Steelers players relish the organization's history, honoring the all-time greats and their relationship with the blue collar attitude. Franco Harris, Jack Ham, Jack Lambert, "Mean Joe" Greene, Terry Bradshaw, Jerome Bettis. The list goes on and on. Pittsburgh is stronger than the hate of one man, regardless of his intentions. We go to work and do our job; nothing will change that mental makeup. The way of life in the Steel City remains, as always, neighborly, optimistic and loving. Look no further than Sunday. Football Sundays in Pittsburgh are nothing short of an art -- parking chairs on the North Shore, Iron City, sandwich concoctions featuring french fries and pierogis; we could go on. All these things -- despite how silly they may sound to outsiders -- build a sense of identity which cannot be broken by one event, however tragic. Still, it'd be naive to suggest this Sunday wasn't different, considering the circumstances. The result on the field -- ​a win over Cleveland -- was all too familiar. Yet, when pressed for a reaction, this city gave a statement perhaps the best way they know how -- through unity. Hatred can't weaken a city of steel. If you'd like to donate to the Tree of Life synagogue in Squirrel Hill, please follow ​this official GoFundMe link.